Alain LABORDE LABORDE: who are you? Simple question but difficult answer! He comes from an important branch of a complex family tree because there are roots at Saint-Mont. He is the beloved younger brother of his older sister (Claude JAUZE) and one of the cousins of Geneviève and Françoise LABORDE. And when the paint meets the tango, or when the tango inspires the paint, it is of an immense wall which Alain LABORDE LABORDE needs to express himself. 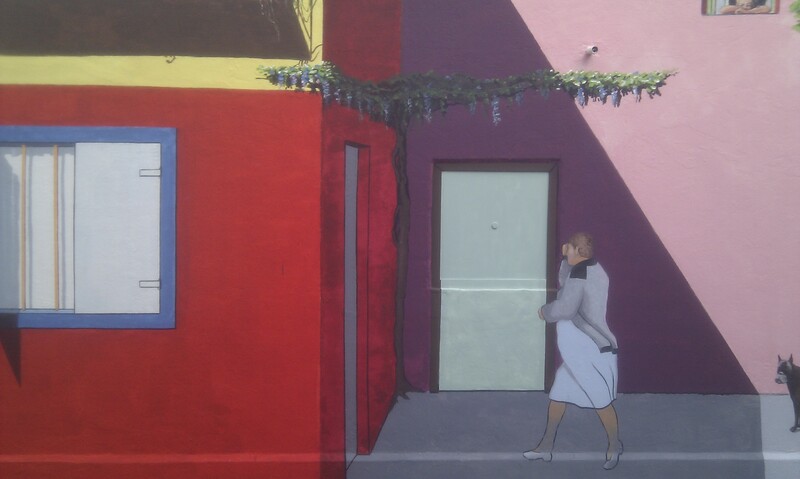 This wall exists ; it is the side wall of a store of TARBES, very known, placed side small street Saint-Pierre. The TANGUEANDO IBOS association is actively involved of this mural. A lot of volunteers supported Alain in this project wanted by the municipality of Tarbes. Moreover the mayor of Tarbes - or rather its portrait - is also element of the decoration. And rather than to tire the Internet user by insipid descriptions, let us admire together some elements of this wall.